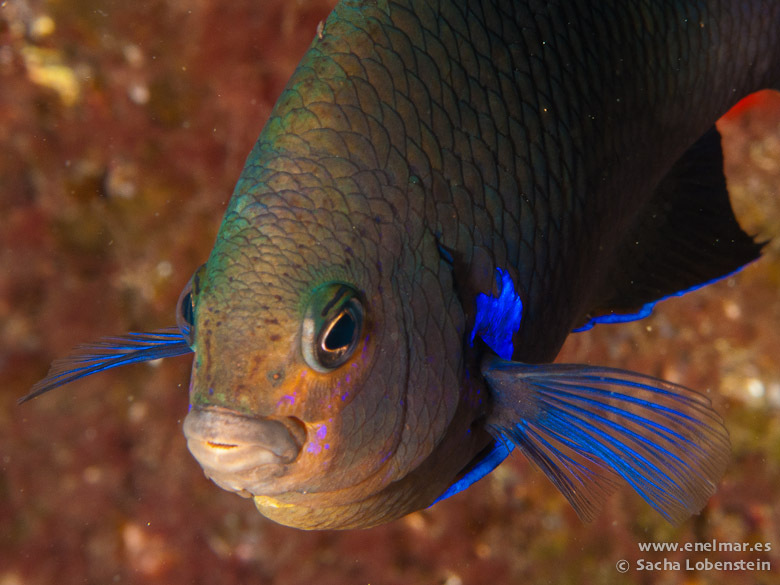 Abudefduf luridus, Fula negra, Castañeta or castañuela, as it is known in some parts of the Canary Islands, is a very colorful fish, belonging to the damsels, a percomorphi species of the Pomacentridae family. 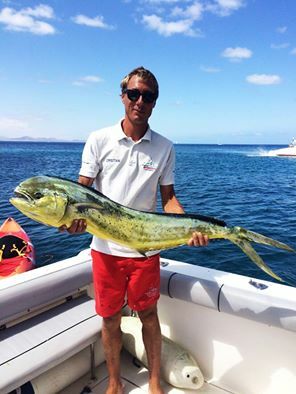 Every day we find this fish in our boat trips from the neighbouring island of Fuerteventura to Lobos. 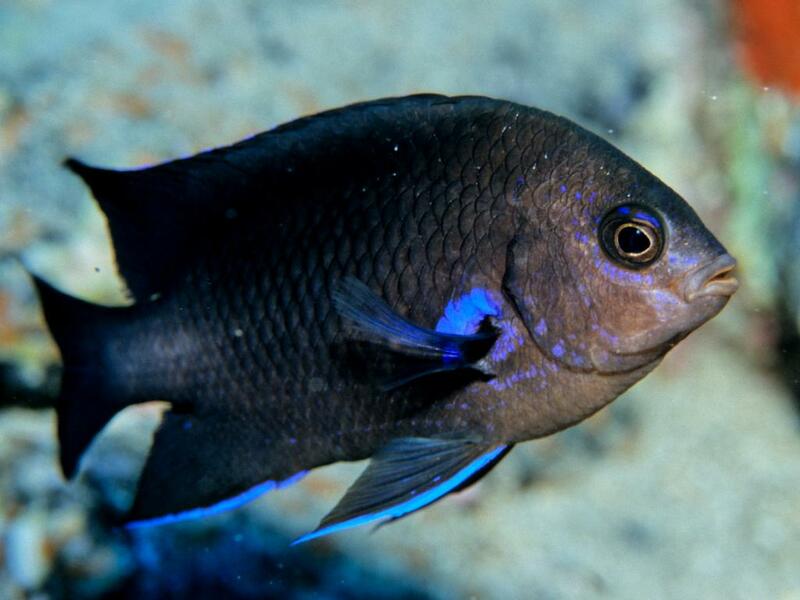 Despite its delicate and appealing appearance, marked by dark colours and gleaming electric blue lips, which makes it look like the harmeless fish in an aquarium, it is one of the most aggressive, territorial and unsociable species that exist in the oceans. This benthic species crosses the rocky sea beds, Cytoseira (algae) prairies and rocky areas in the Oriental Atlantic Ocean: Senegal, Cape Verde, Canary Islands, Azores and Madeira, always above 50m deep and more common less than 25m deep. 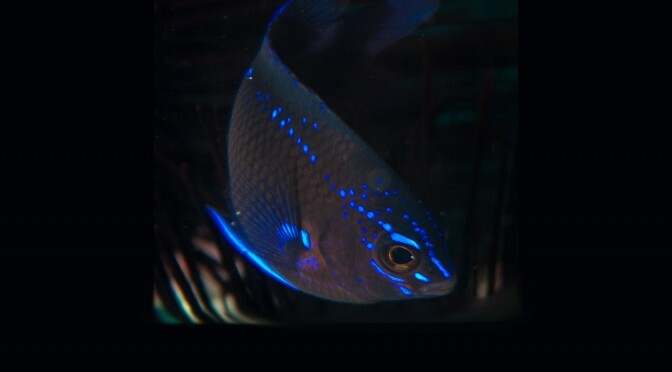 Its showy colouring and great ability to adjust to changing environments and abrupt changes of parameters, makes it a common fish in aquariums, where they can live up to 10 years in captivity, though, it is difficult to keep them in community aquariums, sharing space with other species, unless they have been introduced together while in their young stage. If a new Fula gets into an aquarium where there is already a group, the male leader, supported by the rest, will constantly attack it to death. 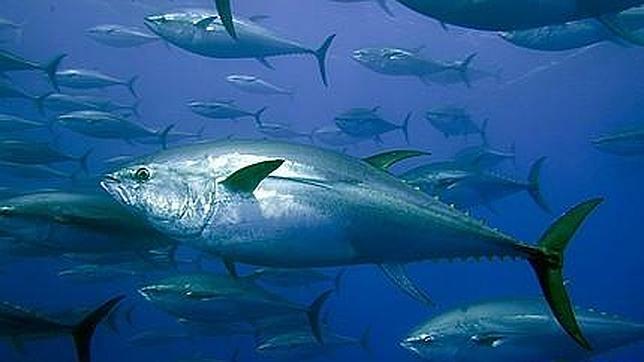 They quickly take control of the space they inhabit, confronting fishes even much bigger than themselves. They are diurnal. They tend to move in fairly dense banks, dominated by the largest male. Males can also be found on their own or living with their breeding females. A male can mate with several breeding females, spawning in summer (what is known as Spawn), in crevices or in nests composed of a group of several rocks, which the male will watch closely during the 3-day incubation period, even ready to kill another male approaching the egg laying area, less than 1 meter radio. 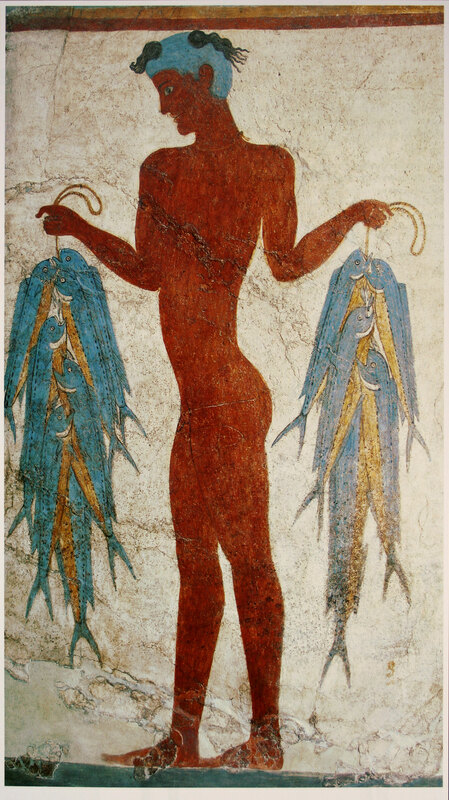 In the fighting, males increase their breathing rate, producing very distinctive sounds in combat; as they belong to teleost fish, which are those with specialized organs to emit sounds. Robust and compact body on their sides, covered with large visible scales, with short and fairly rigid fins. Their eyes and mouth are small and they have a small bulge on their head. They have sharp teeth in both jaws. The colouring which young specimens feature, up to 3 years old, is very striking. They are almost black, with electric blue stripes that sometimes create whimsical patterns. 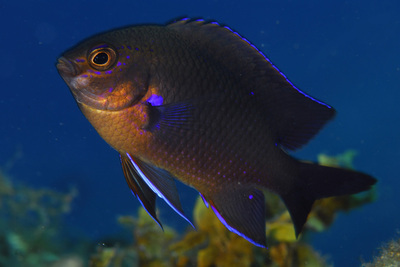 From the age of 3 their color changes from black to grayish brown, excep in their head and the dorsal and caudal fins, which take a very dark blue colour. 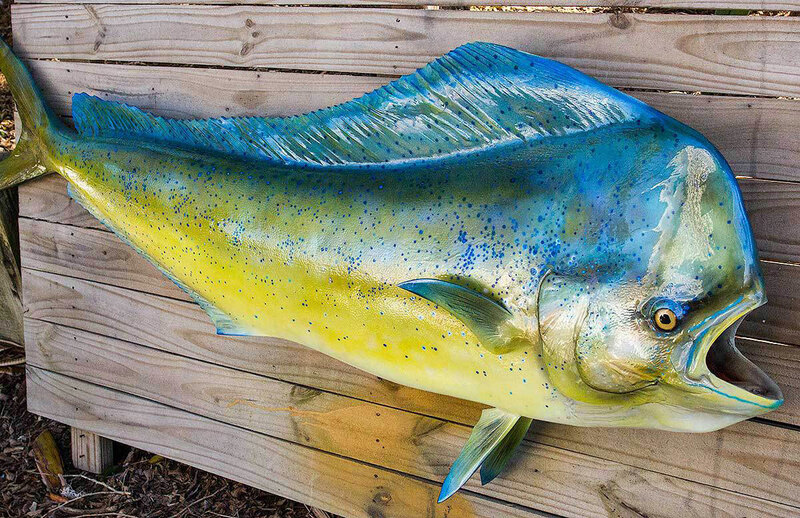 In the adult specimens the electric blue stripes condense on the edges of their fins and head. They are usually 8 to10 cm long and males, slightly larger than females, can reach up to 15cm. An oddity of this species is that there are specimens that are pale orange in the back of their body to the tail, a phenomenon whose cause is scientifically unknown. They feed mainly on small invertebrates found among the algae. 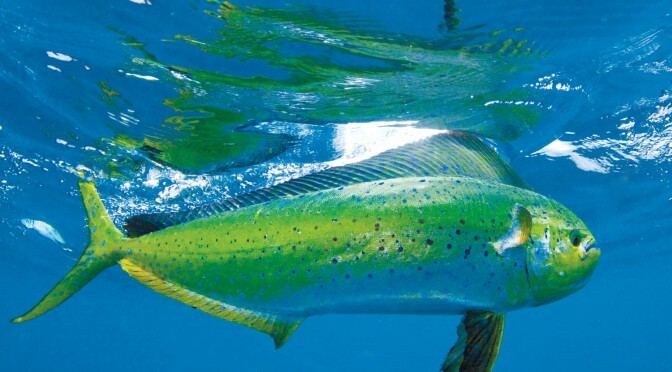 The young fish are extremely sensitive to food, only eating marine plankton, so those which are bred in captivity tend not to survive unless they are given food of this type. 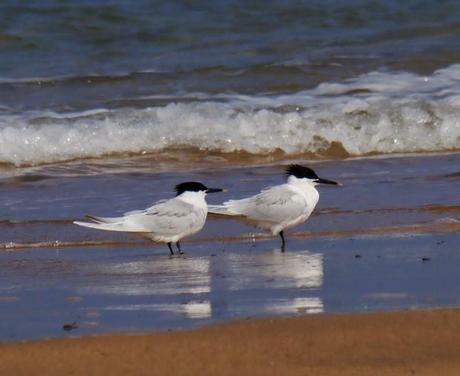 The Sandwich Tern (Sterna sandivecensis) is a migrant seabird that nests on the European coast of Sweden, British Isles, Germany, Denmark, Poland, Brittany and Baltic countries; Also on the shores of the Black sea and the Caspian Sea and in North and Central America. Those living in Europe fly over the coastal area each year from northern Europe to West and Southern Africa, in search of warmth in winter. In this journey, coasts and wetlands of the Canary Islands, are a must stop for these birds, although compared to the migration that exists in the African coast, in the Canary Islands we can say that this phenomenon is less relevant. 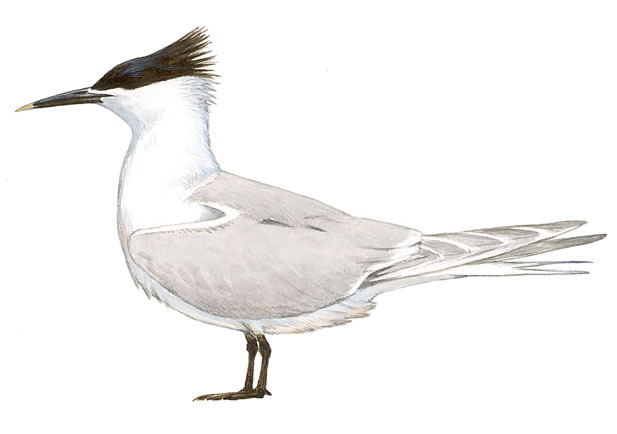 The Sandwich Tern belongs to the order of Charadriiformes, family Laridae, and it has an average size (41cm long and 94cm wingspan). Its feathers are black, white and gray. 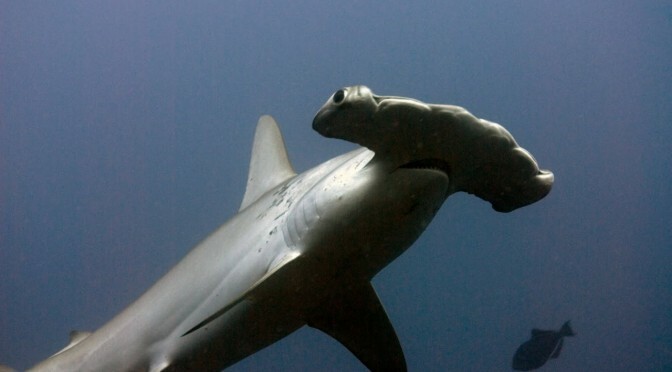 Its round head has a kind of black bun (pileus), which in the mating season can cover almost its entire head. 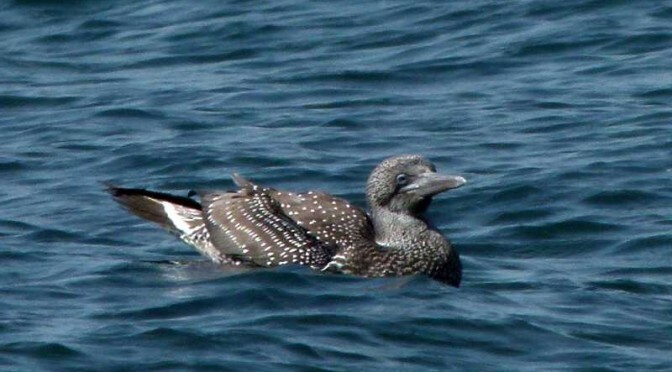 Its beak is long and black with yellow tip and its tail is forked. The Sandwich Tern’s flight is similar to the gulls’, very agile and light, featuring longer and narrower wings though, which makes them more graceful. 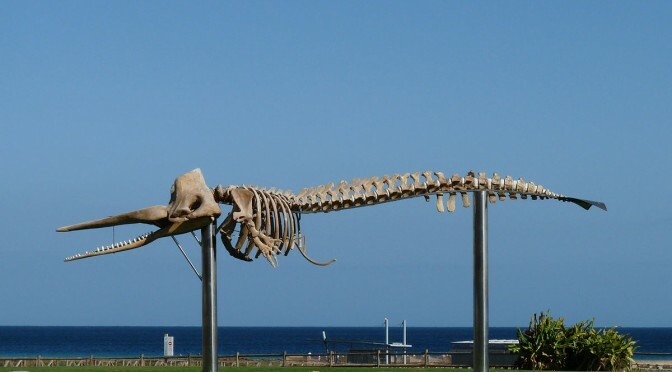 They eat fish on the beaches and in coastal waters; also molluscs and marine worms. 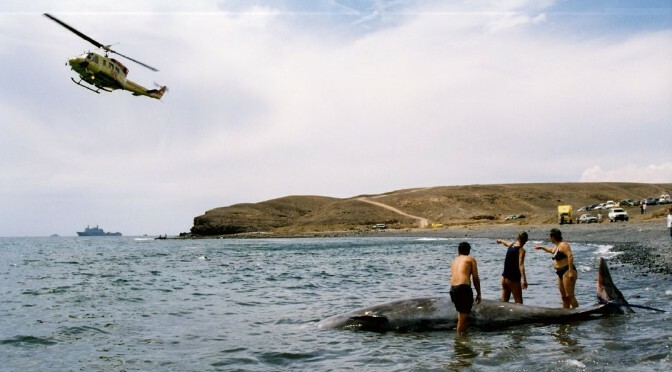 They don’t usually move beyond the continental shelf to forage, and once they have located their prey they pounce on it, plunging into the water. The Sandwich Tern is a very sociable bird that usually creates dense colonies of thousands of individuals. Within the colony, each specimen with its partner lay their eggs (1 or 2) by the end of April or early May. They don’t build elaborate nests, they just use a hole in the gravel, sand or between two stones, and they usually cover it with vegetation. Their eggs have a creamy colour with lots of black speckles, and they incubate them, both father and mother, for 22 to 26 days. 15 days after hatching chicks gather in groups that are watched by an adult, and 30 days later they fly the nest for the first time. 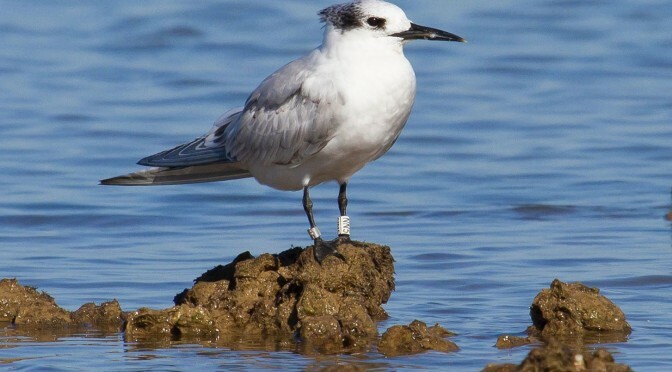 In Fuerteventura we find the Sandwich Tern in ponds, lagoons or lowlands, especially in the area of ​​the beaches of Sotavento (Jandía), El Cotillo, Corralejo, Majanicho, and inland areas, like in Rosa Catalina Garcia, in Los Molinos Dam and in some ravines with permanent water. This bird is regular in this land, so we can find specimens on the islands in almost every month of the year, there are even some that spend the winter on our shores, but when we find the most of them is in autumn (August and September) when they come down to Africa searching winter warmth, and in spring (March and April), when they go back to northern Europe. What determines how long these birds spend on our shores is the peace and quiet they find here and the availability of food to refuel and continue their journey. The manipulation of the environment by man, such as road building or construction, can modify the habitats of these species, by seeking best places to rest. 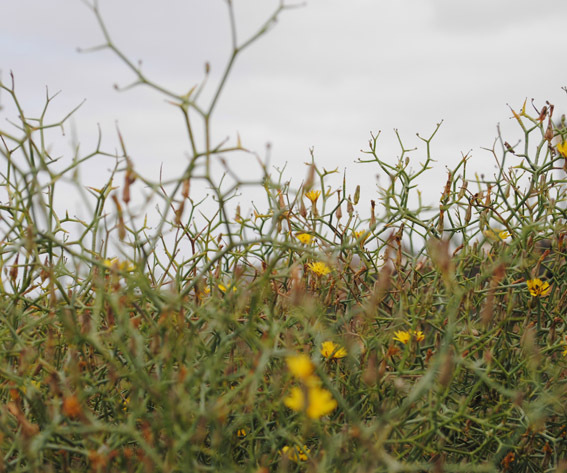 If you’ve been lucky enough to take a trip to Lobos Islet from Corralejo you’ll have noticed, when setting foot on land, some peculiar and very characteristic thin greenish bushes: the gorse (Launacea arborescens). It’s just now (March) when these plants begin to bloom, a period which expands until June. 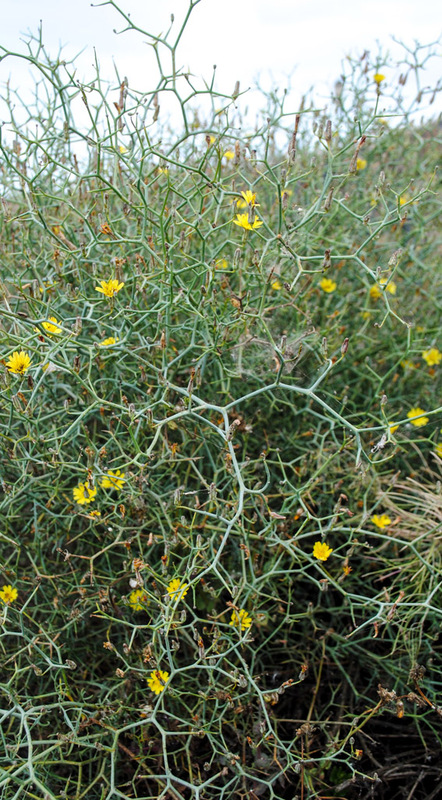 These shrubs are characteristic not only of Lobos and Fuerteventura but of The Canary Islands in general. In Fuerteventura and Lobos these shrubs you can be seen almost all over their surface, probably less common in the highlands. 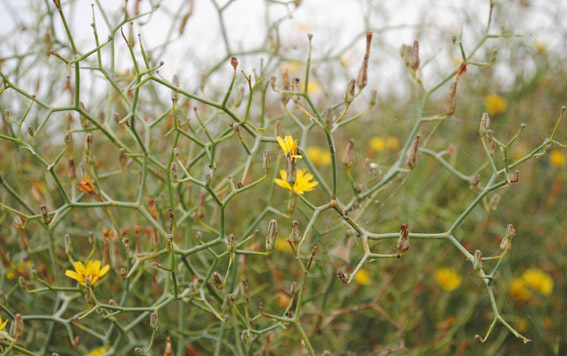 It is a perennial plant, very abundant in the dry and arid lowlands in the Canary Islands. 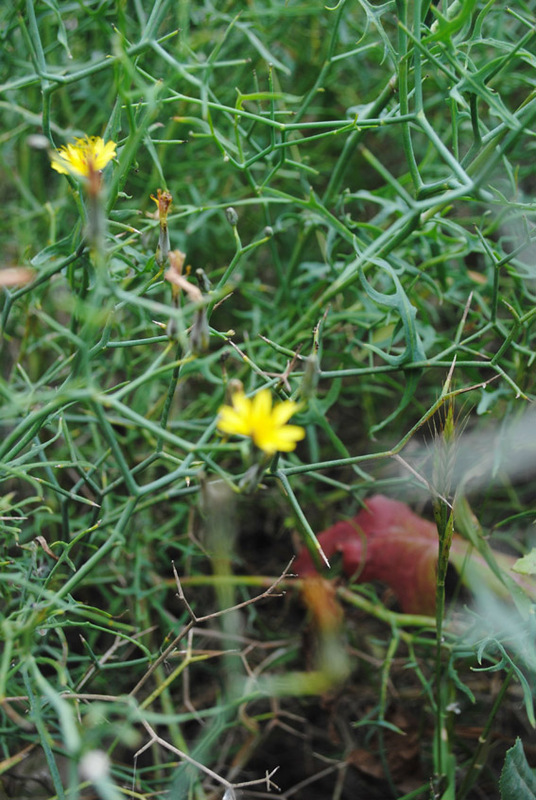 It can grow up to one meter, so they are not very high; their stems are thin, rounded and dull green. We chose the words of this great writer because they describe, with beauty and wisdom, this so abundant bush in our Islands. 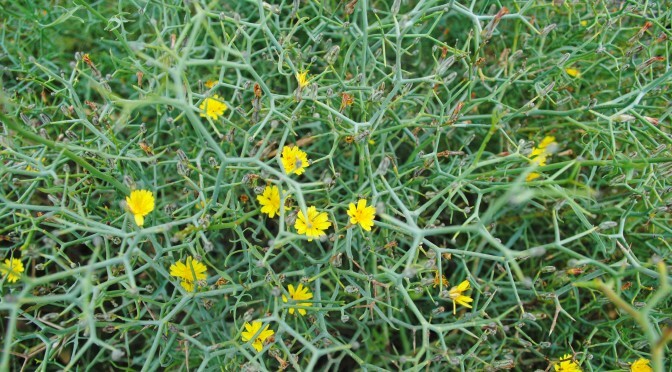 Throughout the years and being so abundant, this plant has had many uses, including the gorse yellow flowers which, on their own or in small bunches, were used in infusion for children suffering from jaundice. As already mentioned by Unamuno, it was also the favourite food of camels and goats. Whether you inhabit these lands or are just visiting it, in the coming months you’ll enjoy the flowers of this shrub, which is “the expression of the island itself.” If you’re lucky enough to accompany us on our trip to Lobos from Corralejo you will see this blooming paradise. We’ll be waiting for you. The arid, wild and pristine islet of Lobos —which we passionately show to the visitors who join our day trips from Corralejo— is one of the few places along with Fuerteventura, Lanzarote and La Graciosa, where one of the most unique bird in the Spanish wildlife lives, the Canarian Houbara. Its habitat are the arid landscapes, “jables” and “malpaís” characterizing the eastern end of The Canary Islands. 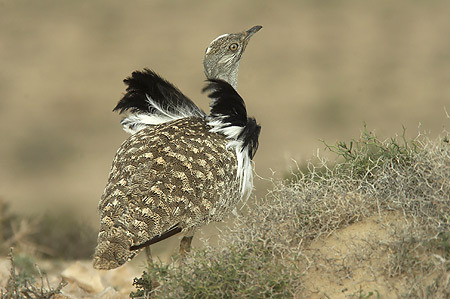 The Houbara or Houbara Bustard (Chlamydotis undulata) is a species of “gruiforme” birds from the Otididae family, fully adapted to living in dry and poor lands; It is an omnivore, a terrestrial and lonely bird found from Mauritania to Egypt and from Sinai to Mongolia, the small settlement in The Canary Islands being unique in Europe. The subspecies inhabiting our islands is fuerteventurae, which is endemic to The Canary Islands. Thin and elongated neck, grey and white shades, it features a comb or small bun of black and white feathers, usually flashier in the male. The chicks, more similar to males, have the duller plumage. Actually this bird seeks to go unnoticed, is easily scared and jealous of its privacy and it seeks to be relaxed for survival so its plumage usually blends in with the landscape except in the mating season. 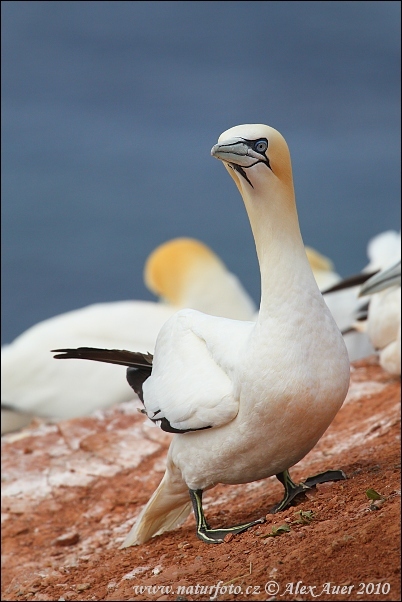 With 170 cm wingspan, it is the largest bird nesting in The Canary Islands. Their diet is varied both animal matter (beetles, grasshoppers, ants, caterpillars, snails and small lizards) and plants (flowers, sprouts, fruits and seeds). 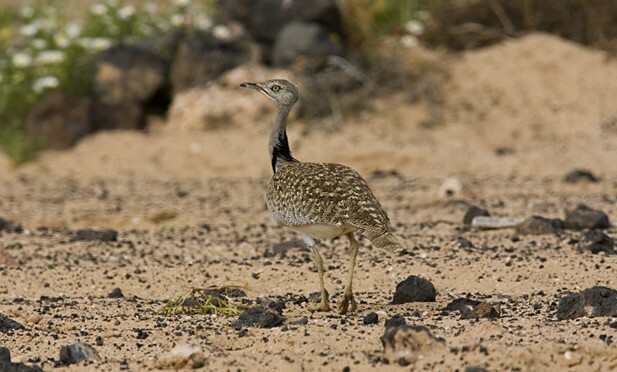 Although the Canarian Houbara is sedentary it can act like the migratory birds, making journeys in search of similar habitats and even flying between islands. Regarding the breeding season, although variable, we can say that it normally starts between February and March and it begins with a wooing which is most interesting since the male performs solo shows, a real dance in which their plumage become more attractive so as to draw the females attention; they spread out the white feathers on their crest and neck, moving in circles and straight; from a distance a flashiest white ball, which changes colour, can be seen, a spectacular wooing dance. Once the female is captivated , after copulation, the male ignores the upbringing and it’s the female that is in charge alone. It usually lays two or three eggs which she incubates for about 23 days, after which the eggs hatch and the chicks are able to move soon after being born and they will be raised by their mother for about 35 days; perhaps occasionally the male may cooperate, but not generally. The chicks usually remain with their mother until the autumn. This endemic bird of the islands, so special and of which we may have about 800 specimens in the archipelago, is listed as an endangered species, threatened with losing their habitat, their peace and quiet, as a result of urban and tourism development and, particularly in Fuerteventura , by the new highway that goes through the quiet and sparsely populated areas that have become home to these peculiar and solitary birds. For the preservation and survival of the species it is essential to protect their habitat. The preservation measures started in 1985 with the drafting of a recovery plan and management programs, education and awareness and implementation of a captive breeding plan. Since 1993, SEO / BirdLife is carrying out preservation projects in Fuerteventura, subsidized with funds from the EU LIFE program. In 2005, this NGO acquired a 200-acre farm, El Cercado de El Jarde, aimed to protect this species, where 18 specimens have been living along with several other species of the “majorera” wildlife. It ‘s a bird that could be classified as difficult to see despite being a terrestrial animal since, as we previously said, it’s very jealous of its privacy, but let’s not lose hope because it is common to see it in very quiet areas running around elusively among the gorse. If you are a respectful traveller and concerned about respecting the peace and quiet in these arid areas they inhabit you are much more likely to enjoy them. 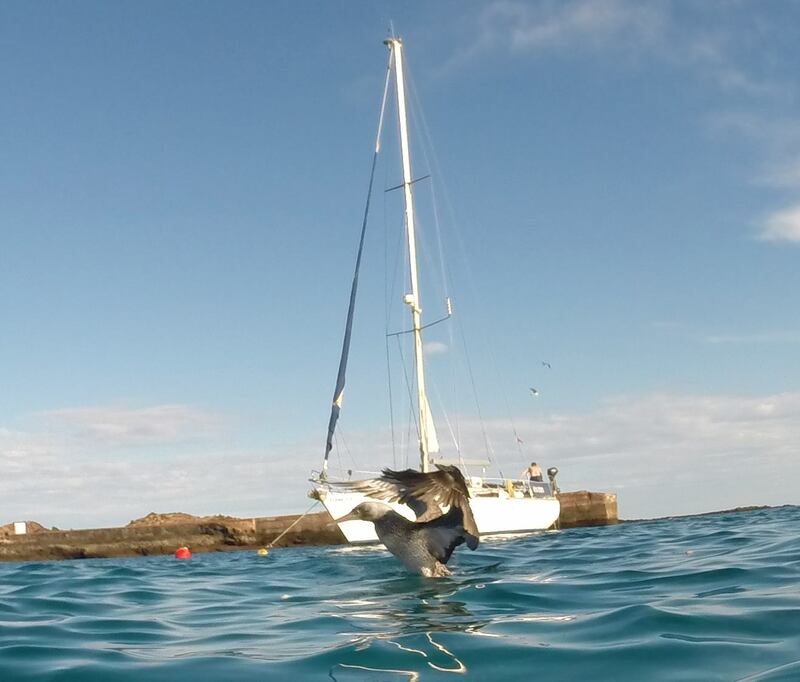 As for us, on our trips to the Islet of Lobos from Corralejo, we are very attentive when we set foot on the islet because although it is not the most common bird sometimes we are lucky to see them running around in this little paradise that The Islet of Lobos is.